Just because the weather is warm doesn't mean you have to put down your needles and hooks! Deborah is joined by Ellen Gormley who will show how to crochet up the Whole Latte Love Tee with an easy openwork yoke and textured stripes. 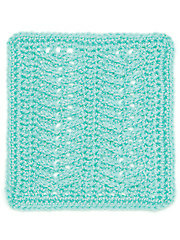 Lena will then show how to stitch up the Knit Lace Sampler T-shirt. Ellen is in the stitch corner with the Fishbone stitch. This is the one I like most right now. The teacher show each step very clear and easy to follow. One of the sleeper, I don't know what to do. She didn't show step by step. I cant make it. Not like this one. Thanks for teach me how to knit and crochet. this tops. I love this show! One thing I personally would like to see is instead of the clothing only being shown on the mannequin, I think they should also be wearing the items. Clothing looks one way on mannequins but different on people. Loved this season. So sad this is last one of the season! Hope Deborah will come back in season 8!